In California there are many rivers and lakes that hold big fish. Whether you're fishing for bass, steelhead, salmon, or trout there is always a good chance you'll hook into something big. It's a shame that we're missing out on the big toothy species that live on the east coast, but what we have here is just as great. This lake currently holds the record for the biggest brown trout caught in California. Although the lake's prime was in the 80s when it was planted with thousands of brown trout each year, it's decline began when the plantings ceased due to whirling disease. The lake still holds +10#ers that are caught fairly often making it the number one spot to find and catch huge Browns in California. It's no secret that part of the Lost Coast in California is blessed with some of the best coastal steelhead fishing in the world. These native sea-run rainbow trout are notorious for their huge size ranging from five to twenty pounds. The state record steelhead caught was taken from the Smith River weighing 27#s! Coastal steelhead are one of the most difficult species to pursue, however hooking and landing one is truly an experience worth a lifetime. In March of 2015 a potential new world record spotted bass was caught out of this California reservoir weighing a little over 11#s. Although the fish was not official certified, word is getting out fast and now the lake is becoming more of a prime trophy spotted bass destination. Spotted bass up to 5#s are becoming more common here making it a hot spot for bass anglers . These two lakes are known for their huge largemouth bass with Castaic Lake holding the current world record. No where in the world do largemouth bass grow as large as they do here, beyond +10#s! These largemouth grow fat from the nutritious planted trout that they eat and with the addition of a long growing season, these largemouth are genetically the biggest of the big. Every year in the spring and fall adult king salmon run up from the ocean to their native rivers to spawn and die. 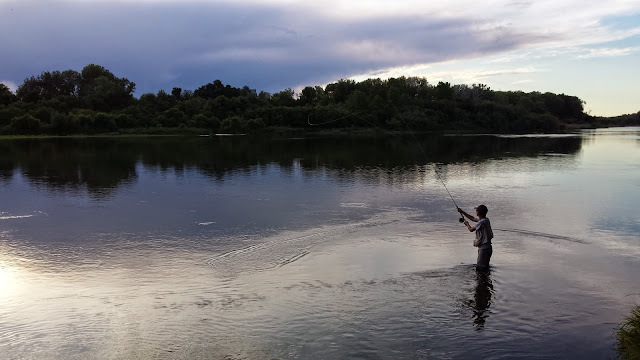 The super highway which the fish use, the Sacramento River, is where anglers can catch these fish during open season. The Sacramento River is also where the state record was set with a king weighing 88#s! Although the record striped bass was set in O'Neill Forebay, a reservoir, I believe that fishing for migrating striped bass gives you more of a chance to find a good fat fish. The river is a lot easier to navigate and finding a good holding area doesn't require a fish finder. River run stripers are where its at. Lake Tahoe is a huge lake which holds equally huge fish. The best mackinaw fishing in the state is here where it holds the California record of 37#s as well as the record koke at 4#s. Although trolling at depths down to 50ft - 100ft may be necessary to catch either species, trophies are very frequently found here. Pyramid Lake is a remnant of one of the last remaining natural lakes formed during the ice age. Although technically located in Nevada, it is home to the worlds largest cutthroat trout with specimen reaching up to 20#s. Pyramid Lake has a long and interesting history as a fishery. You can read about it here.